The M5/114.15.2 monoclonal antibody reacts with the mouse major histocompatibility complex class II, both I-A and I-E subregion encoded glycoproteins (I-Ab, I-Ad, I-Aq, I-Ed, I-Ek, not I-Af, I-Ak, or I-As). It detects a polymorphic determinant present on B cells, monocytes, macrophages, dendritic cells, and activated T lymphocytes from mice carrying the H-2b, H-2d, H-2q, H-2p, H-2r and H-2u but not from mice carrying the H-2s or H-2f haplotypes. 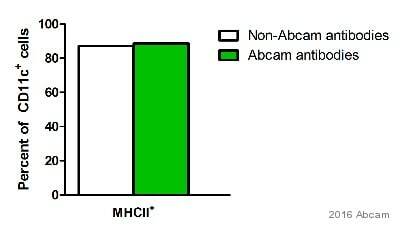 The M5/114 mnonclonal antibody is reported to inhibit I-A-restricted T cell responses of the H-2b, H-2d, H-2q, H-2u but not H-2f, H-2k, or H-2s haplotypes. Tissue/ cell preparation (Mouse): Activated C57BL/6 Mouse spleen cells. Our Abpromise guarantee covers the use of ab93560 in the following tested applications. Flow Cyt: Use at a concentration of 0.0075 - 0.02 µg/test in a 100 µl volume. Flow cytometry analysis showing C57Bl/6 splenocytes stained with ab93560 (solid line). The isotype control was Rat IgG2b PE (dashed line). Publishing research using ab93560? Please let us know so that we can cite the reference in this datasheet.